Some day soon: virtual event on PDA? Whether it’s business use or personal use, we’ve begun to expect that applications on our PDA’s mirror those available on our PC’s and laptops. For business, it’s largely corporate email today – the ability to read and respond (around the clock, I might add!). For personal use, it’s email (e.g. Yahoo Mail, Gmail, etc. ), instant messaging, web browsing and (of course) interacting with our social media sites. With this collection of apps, I’m able to be on the go, but stay connected with corporate and personal email, stay in touch with friends and colleagues via AIM and keep tabs on my social networks (next up: the BlackBerry client for Netflix). Virtual events are a combination of business and social networking applications. Thus, I believe that pretty soon, business users will come to expect virtual events to work on their PDA’s. 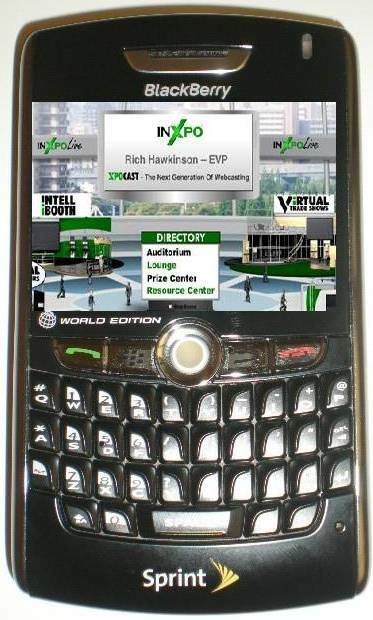 Attendees would be able to visit vendor booths and peruse vendor content (while on the go) and exhibitors would be able to interact with booth visitors via a wireless connection. The “live date” of a virtual event is often planned months in advance – and often times, scheduling conflicts arise for exhibitors – whether it be an important client meeting or attendance at a physical event. I’m sure that exhibitors would value the convenience of doing basic booth duty from their PDA. But how do we get there? First, formats like Flash (Adobe), Silverlight (Microsoft) and even JavaFX (Sun) will need stronger support and adoptoin onto PDA devices. From doing a quick set of Google searches, the adoption (and support) doesn’t seem quite there today. Here’s hopinng for a better tomorrow – where I’ll be seeing you at a virtual event … from our PDA’s. This entry was posted on Saturday, February 21st, 2009 at 4:07 PM and is filed under Virtual Tradeshows (VTS). You can follow any responses to this entry through the RSS 2.0 feed. You can leave a response, or trackback from your own site.